Updated Thursday, January 29, at 8:57 a.m. Businesses, nonprofits and trade associations spent nearly $7.2 million lobbying Vermont lawmakers last year, according to a disclosure database finalized by the secretary of state's office Wednesday. Those groups reported spending nearly $6.4 million of that cash directly compensating registered lobbyists — and the rest, roughly $787,000, on other lobbying-related expenditures, such as advertising campaigns. Vermont's 443 registered lobbyists reported earning $7.2 million in compensation related to influence-peddling last year. The discrepancy is likely due to the fact that lobbyists and those who hire them report compensation figures separately to the secretary of state's office and may calculate them differently. The totals do not include contributions to campaigns, political-action committees or political parties. The majority of the money went to Vermont's 20 lobbying firms, which typically employ a stable of lobbyists and represent many clients. Those firms — and the 55 registered lobbyists who work for them — reported earning just more than $5 million in lobbying-related compensation last year. That figure does not include the money they make from unrelated services, such as legal work or public relations. Vermont's top lobbying firms by compensation in 2014 were KSE Partners ($1.1 million), Necrason Group ($996,000) and MacLean Meehan Rice ($931,000). Lobbyists and their employers report compensation and expenditure totals three times a year. The most recent round of disclosures, due to the secretary of state on Monday, covered the final six months of 2014. The next reports aren't due until April 25, when the current legislative session is almost over. 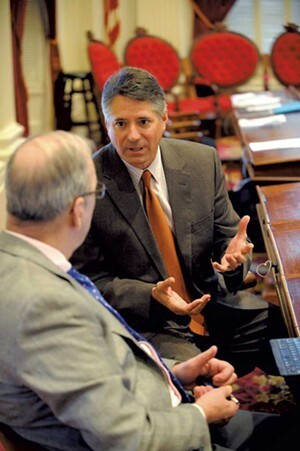 Sen. Anthony Pollina (P/D-Washington) said Wednesday he hopes to change that. He plans to introduce legislation requiring those who lobby the legislature to report advertising expenditures in excess of $1,000 within a day or two of when they’re made. “If somebody is spending a lot of money to affect the legislative debate, people have a right to know who’s behind those advertisements or media buys as quickly as possible,” Pollina said. The $7.2 million that organizations reported spending on lobbying in 2014 was slightly down from the $7.6 million they reported in 2013. But the $7.2 million lobbyists reported earning in 2014 was up from $6.6 million in 2013. Not sure what Vermont lobbyists do? We wrote about it here last April.